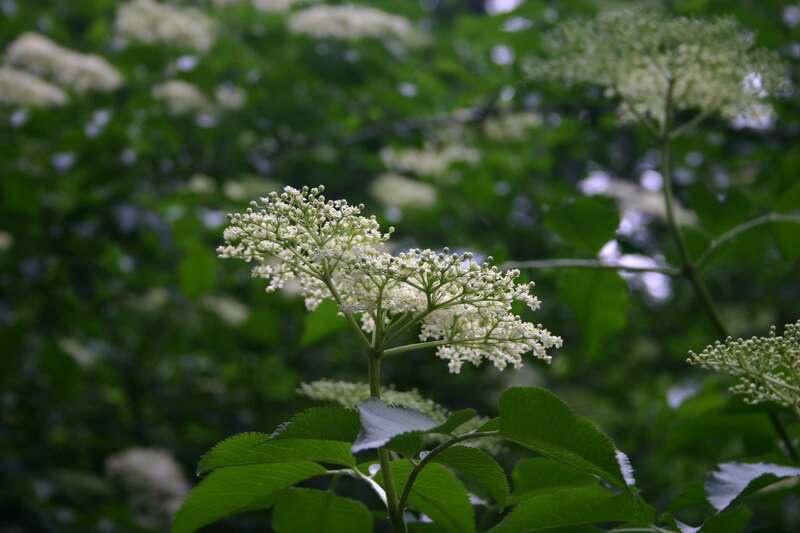 I always assumed that elders grow everywhere, but from the comments on my elderflower cordial post recently I have realised that it is unknown to many. 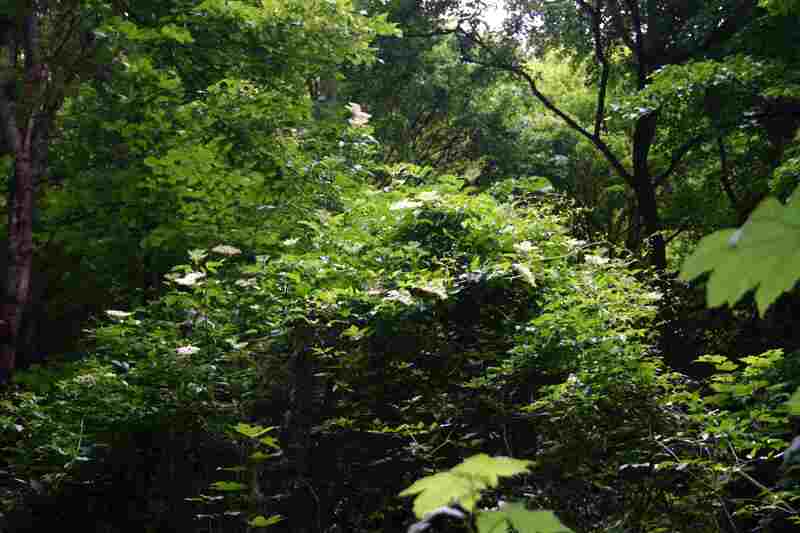 The common elder tree, Sambucus nigra, is a resilient frost-hardy tree/shrub, which grows to up to about 4 or 5 metres tall in our region, but can get even larger. 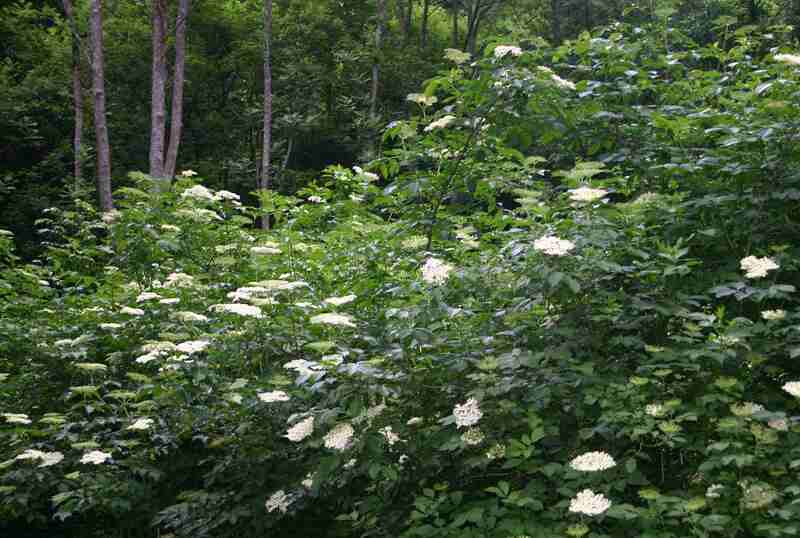 It has bushy, rather untidy growth and appears in hedges or on the edge of woodland, since it likes semi-shade. It can, however, also be found in the full sun and in particular in sandy, nitrogen-rich soil. The large creamy white flower heads, which appear in June, can be up to 25cm in diameter, and are made up of many tiny individual flowers. In September the dark purple berries ripen; they are about the same size as blackcurrants and are rich in vitamin C, but slightly toxic if eaten raw. Their colour dyes the stems they are attached to and is almost impossible to remove from clothes (or fingers!). It is used in the food industry as a natural colouring. The berries can be made into a juice, but are often mixed with apple juice due to their strong flavour. 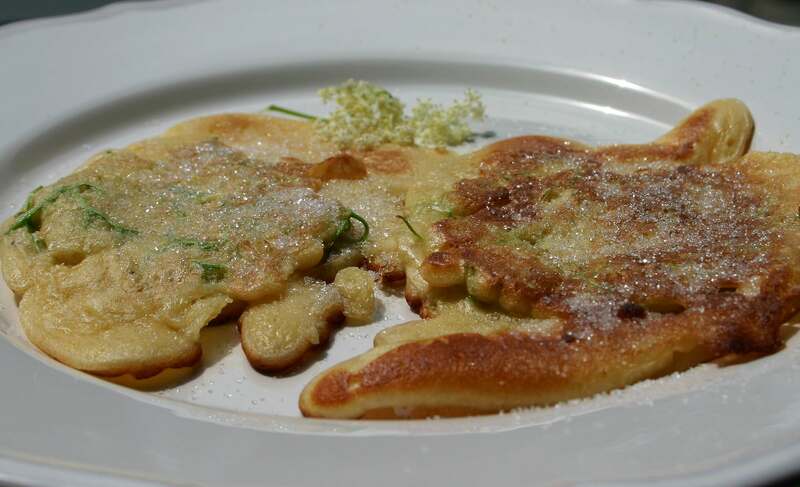 A tradition in this part of the world is to make light pancakes with a whole elderflower head in each one. What a great idea – a special seasonal treat! Hollerkiachl is the Bavarian word for Holunder (elder) Küchlein (little cake). The Bavarian dialect is wonderful and I love it more than any other I’ve heard since living here! It varies from village to village, and often involves completely different words for everyday things! As with dialects, recipes for Hollerkiachl vary tremendously, some involving beer, white wine and other unusual ingredients. Everyone has their favourite version. Mine is a simple pancake batter, a little thicker than usual. Whisk all ingredients except the flowers together. Shake the flowers to ensure there are no insects hiding in them 😉 . Heat a little oil in a frying pan. Dip each flower head in the batter, one at a time, and coat well. Fry in the oil until golden brown. With kitchen scissors, snip off the stalks and turn over to cook the other side. It doesn’t matter if they spread out a bit. They are meant to look rustic! Serve hot, sprinkled with a little sugar. This entry was posted in Food, Nature, Plants, Recipes, Words and tagged Countryside, Food, Germany, Plants, Postaday, Recipes, Seasons, Spring, Summer, Traditions, Vegetarian. Bookmark the permalink. That’s just wonderful! Thank you for sharing this info and traditional recipe. Oh, a hint of vanilla and everything! It’s one of those dishes that we want to eat just once a year, to “taste” summer and remind us how delicate the flavour is. Hope you try them! Now I have to go out in my backyard and double check but I think I have an elderberry bush back there. The flowers and leaves look like the one in your photo. 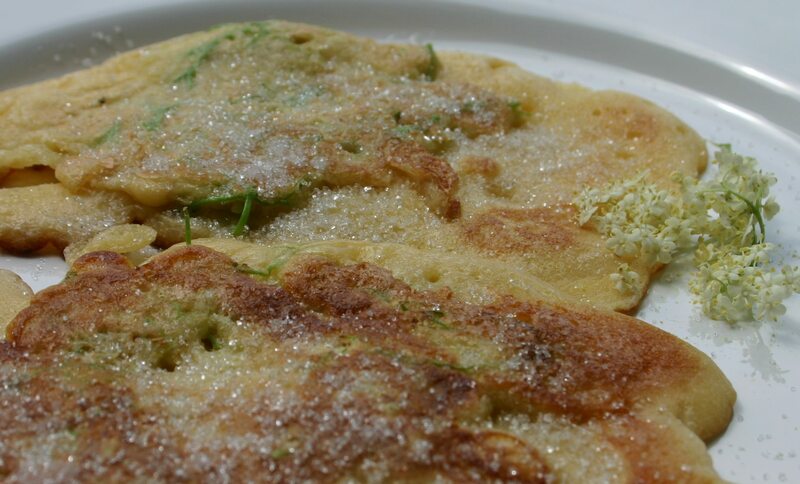 Those elderflower pancakes look amazing! Hope it is an elder tree you have, so you can enjoy some pancakes! 🙂 We don’t have this here… But I take Elderberry liquid extract every day, in my tea. SO GOOD for you!! I grew up in Western PA and elderberries were a staple for jams, jellies and salads. One of my absolute favorites! I must go and check how the berries are doing. Thanks for the reminder! In my nation ,The berry that sambucus nigra can eat, flower and berry can also make wine, the flower can do tea, the berry can do jam, but the sambucus nigra fruit of the wood green part and immaturity poison, the seed of assortment berry is also poisonous, so must be careful. I love you blog, I love plates and flowers. Yes, the berry is very difficult to digest if not cooked and must only be eaten in small quantities when ripe. Thanks for visiting!